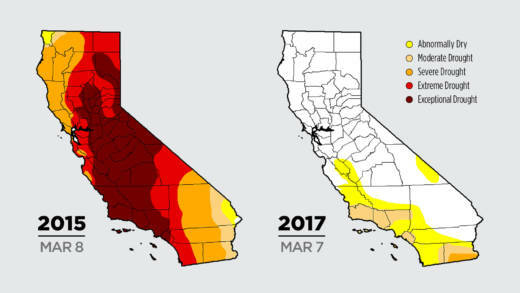 If tracking California's epic drought has become an obsession for you, as it has around here, you've no doubt spent some time poring over the multi-colored maps known as the U.S. Drought Monitor. The maps have vividly portrayed the dry times according to how parts of the state were classified; blood-red for "exceptional drought," bright crimson for "extreme drought." Recently and rapidly, the weekly maps have retreated to less alarming tones of beige and yellow, for "moderate drought," or just "abnormally dry." But who are the artists behind this parched palette -- and what are they basing it on? "It's a judgment call based on a lot of data," says David Simeral, an associate research scientist at the Western Regional Climate Center in Reno. He's one of about a dozen "national authors" who take turns doing the maps on a rotating schedule. Simeral says authors look at more than 100 indicators, ranging from precipitation data and snowpack levels, to soil moisture, stream flows and "vegetative health" (including satellite data that looks at "greenness"). They then plot out conditions on the map along contour lines, using GIS software (for Geographical Information System). The Drought Monitor's home, if it can be said to have one, is the National Drought Mitigation Center at the University of Nebraska-Lincoln, though there appears to be a battalion of cooks in this kitchen. Apart from the rotating authors, there are about 450 contributors from various government agencies, who collaborate on the weekly maps. To help come up with the California map, the National Weather Service leads a bi-weekly conference call with regional experts who can weigh in on factors that might change the status of different parts of the state. That group makes recommendations to the weekly author for potential changes. "In the end it's my judgment call as an author whether to make the changes or not, on the map." The next week, it'll be up to the next author in the rotation. Asked about these critiques, Simeral is unruffled. Ecological: when lack of water begins to have adverse impacts on natural ecosystems, such as the mass die-off of trees during California's 5-year drought. Simeral says the authors take all types of drought into account. "I think we use a real comprehensive approach," he says. 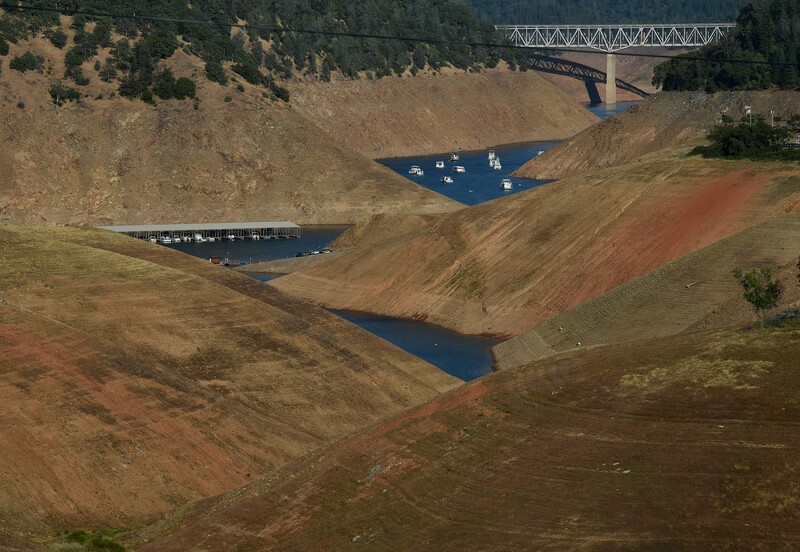 "California poses a challenge for a single map such as the drought monitor," admits state climatologist Micheal Anderson, who is part of the regional focus group that advises the national authors. Consequently, Anderson says the California map could lag behind conditions going into a drought. On the flip side, others have criticized the Monitor for backing out of the drought too quickly, not taking adequate account of long-term groundwater depletion. This week's map shows little more than one percent of California still in severe drought (vs. more than 60 percent just three months ago), though many of the state's aquifers will take years to refill. Simeral says the authors and consultants absolutely put groundwater levels into the mix. "We're able to verify the data with individuals on the ground who are seeing impacts, whether it be to agriculture or wells running dry -- things like that." Those observed impacts matter, as officials use the Drought Monitor to guide them in meting out billions of dollars in federal drought relief to farmers and ranchers around the country. The maps can be politically charged. Simeral says the authors hear from many with perceived stakes in the map, such as local water agencies that don't want to alarm customers. On the other hand, the State Water Resources Control Board has fretted that too much easing of conditions on the map could undermine its pleas for continued water conservation. Simeral says that none of these political concerns influence the authors. "We stay out of the political end of things, period," he says. While experts can debate its technical merits, in this age of "data visualization" (which often means compulsively mapping everything), the Drought Monitor -- while it may not tell the whole story -- has caught on, as people search for simple tools to keep up with the roller coaster ride that climate is fast becoming.